When looking at your client’s lifestyle, ask yourself which core exercises are best for restoring function and safely progressing your client to a firmer midsection. In this course you will learn about how the Core functions and training techniques geared to reduce pain and improve function in daily life. 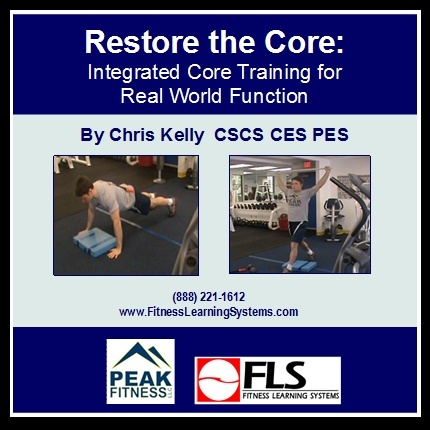 Core restore provides a unique combination of static, isometric, and standing core exercises that increase function without putting strain and torque on the delicate spinal structures. This course is part one in a two part series. Part two is Core Complete Training: A Systematic Approach for Aesthetic Core Development. Understand the basic concepts of core training including the abdominal brace, common training errors, and how to gain your client’s trust. Learn 5 Core Restore steps for progressing core training exercises. Learn and practice Inner and Outer core assessments for your clients. Understand the benefits of plank exercises and learn 5 Plank Principles. Learn and practice inner core training exercises for your clients. Learn and practice dynamic warm up and hip mobility exercises for your clients. Learn and practice outer core training exercises for your clients. Learn and practice standing core training exercises including anti-rotation and anti-extension exercises.